Easy DIY recipe tutorial for homemade eclairs. 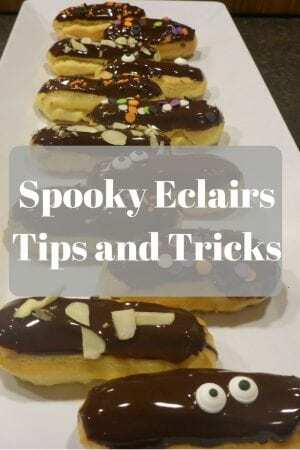 Make them spooky eclairs for Halloween or simple eclairs for a yummy dessert for any time of year. 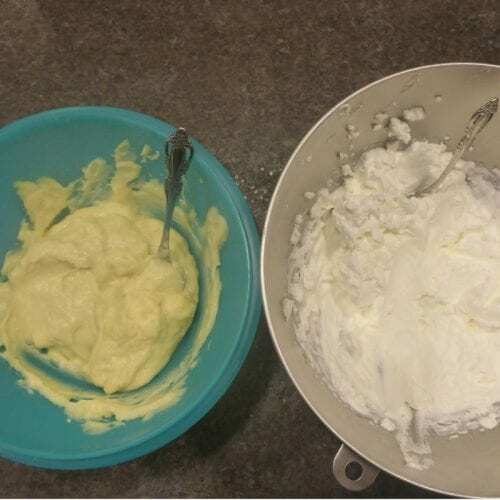 Put the water and butter in a sauce pan and bring to a boil, Add the flour all at once, and beat quickly with a wooden spoon until the mixture forms a smooth ball, about a minute. Remove from the heat and put the dough in the bowl of an electric mixer. Add the eggs one at a time, beating about a minute after each one. The dough will look shaggy at first but will come together and look smooth after a few of the eggs are in there. Put the dough into a pastry bag and pipe your eclairs onto parchment paper lined baking sheets. 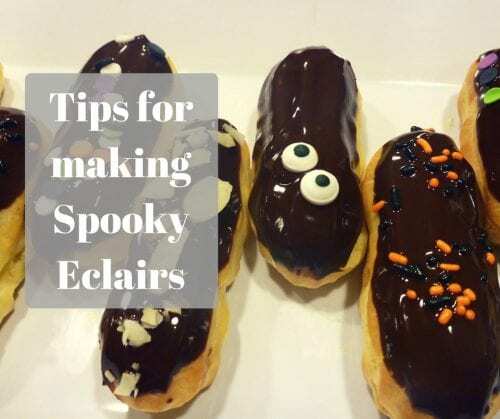 I like to use a star shaped tip because I think it gives the eclairs a little more texture. TIP: the eclairs will almost double in size while baking, so allow for that! Use any kind of creme you like for the filling. Even instant pudding works just fine! Here’s a tip for you – to make the filling lighter whip a 1/2 cup a heavy cream and a fold into the creme just before filling the eclairs. So yummy! To make the glaze, melt 1/2 cup of your favorite chocolate chips. Want to know how to make your glaze super shiny???? 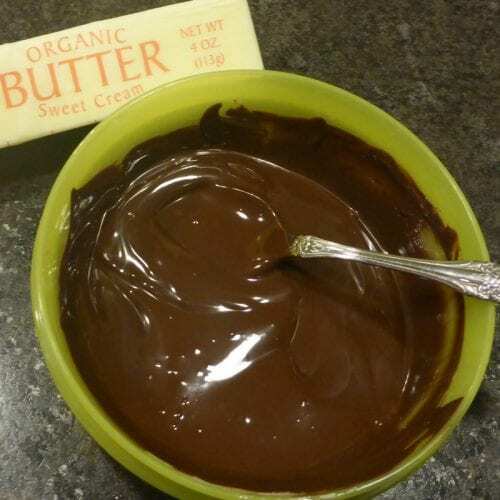 Mix 3TBSP soft, unsalted, butter into the melted chocolate, that’s how! It will make your chocolate so shiny an smooth. Everyone will be so impressed! 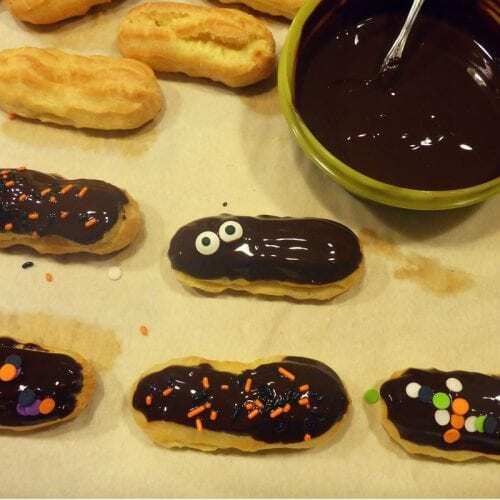 Now, there are two ways to fill your eclairs. Fit a pastry bag with a #8 tip, fill with the pastry creme, poke two small holes in the bottom of each eclair and pipe in the creme. This is the way the bakeries do it. 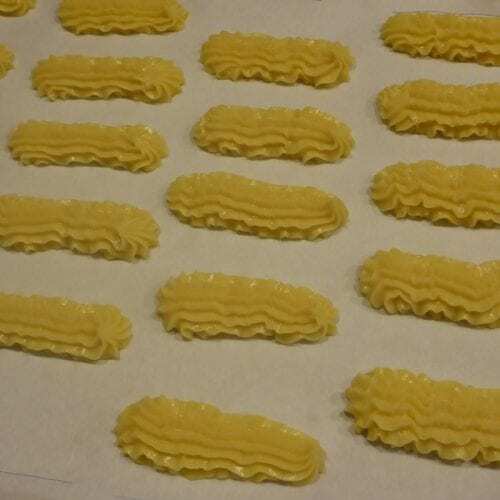 Cut the eclairs in half, lengthwise, spoon the pastry creme in the bottom, setting the top back in place. After you the filling in – dip the top in your shiny glaze. If you cut the eclairs in half, use a spoon to spread some glaze on top instead of dipping. Add your favorite toppings – the candy eyeballs are by far my favorites. Arrange on a pretty tray and you are done!